"Unforgivable Blackness", a biography of boxer Jack Johnson by Geoffrey C Ward, has won the William Hill Sports Book of the Year award. 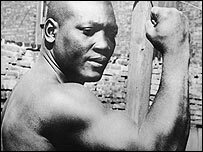 Johnson became the first black heavyweight champion of the world when he won the title in 1908. But he suffered severe racial prejudice and spent time in jail and seven years in exile. Six books were up for the prestigious award which is the richest sporting literary prize. Winner Ward is set to receive £18,000 and a free £2000 bet. William Hill's Graham Sharpe said: "The winner had to fight off a very stern challenge from an extremely strong shortlist and is a thoroughly worthy addition to the Award's roll of honour. "The book is a great tribute to a man who changed the sporting world forever a century ago."